Multiple benefits, recommended for skin troubles. Uses fish collagen. !! 柳燕老師 Recommended on 女人我最大 !! Are you looking for an anti-aging collagen supplement that's easy to take? Beauty Chocola Collagen is a collagen supplement in tablet form! Simply take three a day and be amazed at how firm, moisturized, and youthful your skin can look. Wind back the clock and achieve skin that looks beautifully healthy from the inside out. Why take Beauty Chocola Collagen? Also known as Chocola BB Collagen, Beauty Chocola Collagen is one of our best selling products! These supplements give you all the collagen you need for beautiful skin. They're also packed full of vitamins, minerals, and other beauty enhancers to improve the health and beauty of your skin and body. Our customers love how easy they are to take, and the peace of mind of knowing they are getting a vitamin-based product made to Japan's high quality and safety standards. This tablet type collagen supplement requires none of the hassle of measuring or mixing powders. Simply take the easy to swallow tablets with water and you’re done! We highly recommend this product for anyone with a busy lifestyle who wants to start or maintain a habit of taking collagen. If you are someone who has trouble drinking powdered type collagen due to the taste or smell, this is also a great choice for you. Collagen: Why take collagen supplements? Collagen is one of the most important parts of our body, but we produce less of it as we age, which leads to wrinkles and a loss of elasticity and firmness in our skin. The low molecular weight collagen derived from fish in Beauty Chocola Collagen is easily absorbed by the body to replenish our supply, helping to maintain youthful, firm skin. Vitamin C: It’s not just good for colds! Vitamin C helps brighten the skin, boost the body’s collagen production, and even helps fade spots that come from sun damage. Vitamin B6: Maintains a healthy hormonal balance, preventing acne, and helps skin repair and renew itself. Vitamin B2: Helps heal skin inflammation such as acne, eczema, and other conditions such as skin dryness and sun damage. Boosts the effect of other vitamins in the body. Vitamin B1: Protects against free radicals that cause visible signs of aging like wrinkles, fine lines, and age spots. Helps strengthen over-sensitive skin and heal and acne, dryness, and flaky skin. Vitamin B5 (pantothenic acid): Encourages skin repair, strengthens the skin barrier, and boosts antioxidant levels in the skin. Niacin: Helps reduce the visibility of fine lines and wrinkles, treats acne, and boosts skin hydration. Helps fade scarring and improve evenness of the skin tone. Take 3 tablets per day with water, without chewing. Note: Excessive intake of Chocola collagen will not cure any diseases or increase any health-improvement effects. Allergen note: Please refer to the list of ingredients in Beauty Chocola Collagen, and refrain from using if you are allergic to any of the substances. Note for those with dietary restrictions: The collagen in Beauty Chocola Collagen is derived from fish. However, please note that the manufacturer has not obtained Halal certification for this product. Looking for more Chocola products? Wonect has the full range! Or click here to check out the Chocola BB main page! 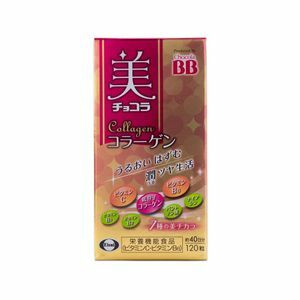 Looking for the best Japan price for Beauty Chocola Collagen? Be sure to put this Chocola BB into your wishlist by logging in, or sign up today to enjoy 500 points discount immediately~ Wonect offers FREE deliveries worldwide and has daily deals, so do check back for the best prices from Japan!